It really feels extra rewarding to complete real-life tasks when using HabitRPG and this provides you with a little extra motivation. History statistics are kept for all tasks so that you can look for trends in your behavior. New features are introduced regularly. 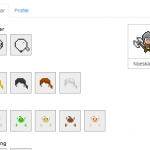 This past few weeks pets, the ability to create a user profile for instance and avatar customization were introduced. Yes, I’m a girl now! There will be iPhone and Android apps soon as the Kickstarter was successfully funded. From a technological perspective, I really have a soft spot for the chosen technologies and applications. This guy is using awesome things like MongoDB, github and Trello (for planned features, you can even vote there!) and I love it! They are not trying to re-invent the To-Do-list-management-wheel and there is planned integration with existing task managers like Remember The Milk, Google Tasks and Evernote (my fingers are crossed for Astrid). As is the case with many new projects, there’s still a lot of bugs and server load issues to be ironed out. This typically shows up as ‘unable to connect’ messages and sometimes the game can’t be accessed at all. No social media integration or friends functionality yet, it would be great to provide some extra motivation. Using HabitRPG alongside your existing task management techniques gives you extra overhead and bookkeeping to do. I’m not sure how well this would work for non-gamers at all. Then again, it doesn’t need to be for everyone. 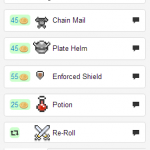 I really enjoyed using HabitRPG a lot and will continue to use it after this month. I really feel the gamification aspects give me an extra reward as I complete tasks in real life. I love how well it works for both personal habits like eating healthy food as well as for work-related activities like getting tasks done. I can honestly say I’ve eaten more fruit last month due to HabitRPG and enjoyed completing Pomodoros more, because they will give me more gold and experience points. The things I didn’t like so much are mostly currently being worked on. I unfortunately can’t speculate on if such a system would be helpful to non-gamers at all. Will it work for you? There’s really no way of finding out other than trying it out for a while. You have so much to gain (experience and gold) and almost nothing to lose (health)! If you do give it a try, I’d love to hear about your experiences in the comment section. Updates on the project can be found on the official HabitRPG blog. Hey i just saw your twitter link about ur blog. Wonderful post. I been using Habitrpg just over one month now and I find it very good useful it helped me read more books and saved articles aswell as using workflowy more often and it also help me get myself to do more exercise. 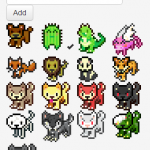 I cant wait till habitrpg have they own moblie app. Thanks! I’m glad you like it and good to hear it’s helping you get things done as well. I can’t wait for the app either, it will be so convenient! 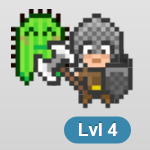 Could I join ur party on habitrpg ? Wow, we have parties now? I didn’t notice yet ^^ What’s your User id? you mentioned them and i guess i saw them in the kickstarter video, but haven’t spotted this feature on my habitRPG by now ?_? Yea, just mouse-over one of your Habits for instance, and the far-right symbol that looks like a bar-chart shows you the progress 🙂 Not much beyond that yet unfortunately. how is this even possible? i asked myself once in a while, what might be up with this little bar-chart symbol. hovering/clicking in it didn’t come to mind, apparently. D’OH. Hey Noeska, great review. I’m in agreement with what you said! I remember trying HabitRPG last year, and then I was reminded of it by Kickstarter. I’ve started using it again and it really does add a bit of fun to accomplishing tasks. I don’t know how you manage to run so many blogs while studying for a PhD! You must be crazy productive. Is there anyway i can join existing parties? Yea, as far as I know, there’s no overview of available parties anywhere and all you can really do is ask the party-leader to add your user-id to the party? your article was intresting to read. I am very sceptical with these types of self-improvement gamification programms and couldnt find research about long term positive effects. do you stll use this programm? would you still recommend it in terms of changing behaviour? I think you are right to be skeptical 🙂 I quit HabitRPG (now called Habitica) for the longest time, just because it was too much overhead on top of my other systems. I now got back into it after some years, because a friend of mine has a very nice party (and we do quests together). What works well for me is to separate the purposes for each of my systems well, so I use Todoist for task management, and Habitica only to work on ‘life-improving’ things to do (healthy eating, exercise, etc.) and daily habits. I do not use the Todo option at all in Habitica anymore. It is fun to get a more immediate reward for doing the right thing, and helps me to be more motivated to achieve my goals. I would encourage people just to try it out and see how it works/doesn’t wok for you for yourself.